In its upcoming January cover story titled ‘Better than humans’, the Wired magazine provides a compelling sneak peek into the future of our workplace / economy / and our lives where robots or industrial scale automations replace 7 in every 10 of our current jobs. Right now we think of manufacturing as happening in China. But as manufacturing costs sink because of robots, the costs of transportation become a far greater factor than the cost of production. Nearby will be cheap. So we’ll get this network of locally franchised factories, where most things will be made within 5 miles of where they are needed. The first thing that occurs to me is that soon enough Apple Inc., could finally do away with that painful euphemism of “Designed by Apple in California, Assembled in China” for a simple “Made in U.S.A” on its packs. Phew! But it is only the tip of the ice berg. Some tectonic shifts seem to be underway at industrial scale – literally. A recent story on The Economist about Foxconn: The Taiwanese-Chinese contract manufacturer that notably makes most of the iProducts, Kindles, PlayStations, Wii Consoles and Xbox etc, hints at those very shifts that are rumored to be already underway. 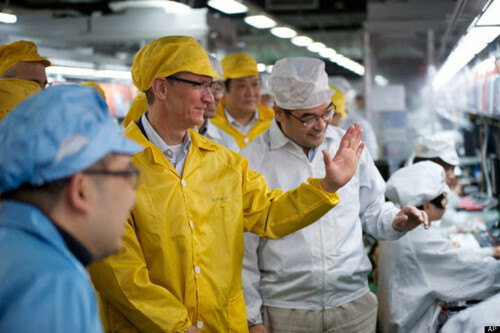 It is well known that besides Product Design, one of Apple’s key strengths is its Supply Chain. In fact with each iteration it does on its product lines (for e.g., the iPhone versions 2,3,3s,4,4s,5..) when there is only so much it can innovate through product design and specs, the obvious place where it would seek recourse would be its processes and supply chain – cut costs and drive margins. In other words, for every new iterative product version that Apple brings to market there is immense pressure on the company to optimize the basics ofits value chain. Now that’s when things start get interesting. Manufacturing Costs: Foxconn’s Chairman Terry Guo vowed to build 1 million robots and has hinted that the firm is just a year away from the big breakthrough – robotics that work at scale on commercial lines. Transportation Costs: The article also acknowledges that there have been rumors about Foxconn planning to open a factory in the US. Just come to think of the impact that these two changes in industrial production and transportation would have on Apple Inc, Foxconn in the short term as also on the economies of US and China in the long term. Don’t miss the full Economist article (and don’t get misled by its title that seems to focus on Foxconn’s workers’ issues). The big picture is clear. It signals a dramatic yet a silent shift currently underway in the biggest manufacturing hubs around the world. A shift that can soon challenge the conception of developing markets as manufacturing hubs. A shift that can have a dramatic impact on assembly line jobs at the low end of the value chain. A shift that can eventually impact the very nature of economies around the world. Interesting times. These are indeed. High time then – the developing economies ought to seek more sustainable ‘business models’. Else let’s just say that things can only get even more interesting. This entry was posted in Uncategorized and tagged Apple, Foxconn, Industrial Automation, Innovation, Manufacturing, MIT, Product Design, Robot, Robotics, Supply Chain., The Economist, Transportation, Value Chain, Wired Magazine. Bookmark the permalink.